Cities need to create a plan to become a leader in the Smart Cities space, but often don’t know where to begin. 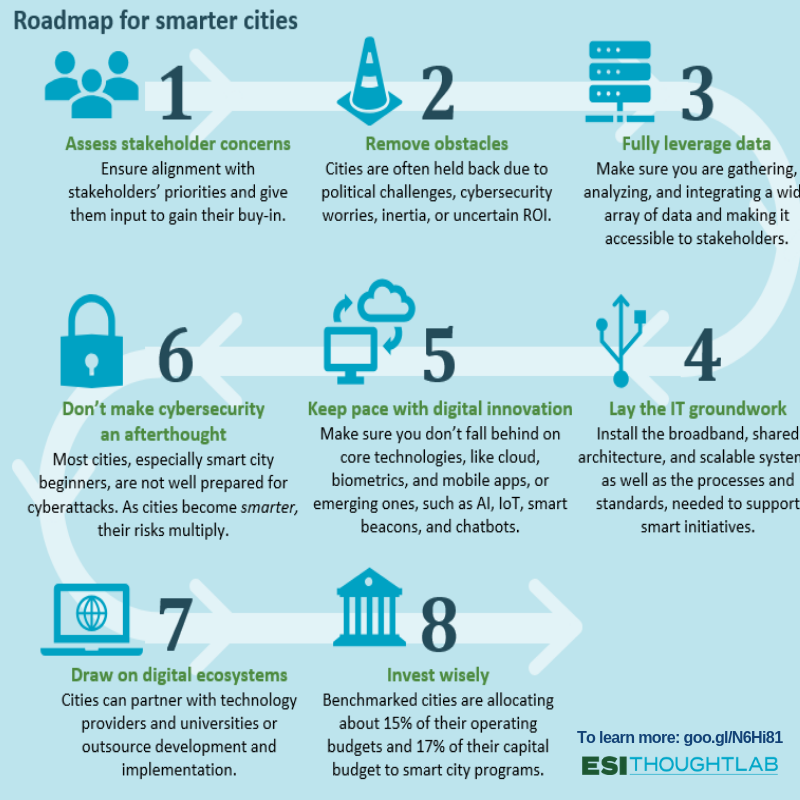 To support cities in this effort, ESI Thoughtlab teamed up with sponsors and research partners to provide data that would support the smart city needs from the government perspective to the businesses and citizens that live and work there. As a partner of the Smart Cities Council, we are already looking at offering smart solutions to help our clients build smarter communities. By supporting this study, we can go beyond implementing smart solutions. This study and the data collected allows us to provide our clients with the knowledge needed to transform their community for continued success in the future. Smarter Cities 2025, the report released earlier this week, features an in-depth benchmarking survey of government leaders in 136 cities around the world. Each city received a maturity score, categorized as beginner, transitioning, or mature. Eleven cities were then chosen for a deeper dive that surveyed businesses and citizens. This allowed ESI to determine how well-aligned different types of stakeholders were with each other, ultimately discovering an extreme disconnect between the smart cities initiatives that governments stated they had in place, and what the businesses and citizens perceived the government to be doing. So, what is the most effective path to becoming a smart city? That question could only be answered after analyzing the ‘10 Pillars of smart city success’. These pillars are broken into ‘foundational’: governance, economy, infrastructure, talent, and funding; and ‘tech-enabled’: mobility, environment, public safety, public health, and payment systems. Our smart solutions fit into these pillars with a focus on facilities management, energy, transportation, and water/wastewater. Key findings of the study relate directly to the way we support our clients. Building a roadmap is essential for cities and communities to succeed, and to do that they need resources. Our team has been involved with workshops across the country helping cities build the best plan for their specific needs through the Smart Cities Council Readiness Challenge. Top benefits vary by stakeholder. Our clients range from federal to municipal and through various markets. The specific requirements of a project keep our approach innovative and ensure our services are focused on meeting our client’s needs, and solving the problems are clients are facing. Mobility is one of the most heavily funded pillars in a community. The study showed that the future of mobility is multi-modal, involving a wide array of fully integrated and connected options, including public and private services across all modes of transportation. Smart cities are developing choices to meet the changing needs of communities, like ride-sharing, bike- and car-sharing, smart transit systems, smart traffic signals and smart parking. Adaptive traffic signals, for example, can change a community by cutting congestion and pollution. The study found that smart traffic signals can offer per capita annual personal time savings of 9.7 hours and fuel savings of 3.3 gallons per capita. Improving environmental sustainability, energy use and resource allocation through innovative solutions is the number one challenge that cities face, ranking just one above climate change, a related issue. Climate change, energy usage and environmental consideration are of increasing priority as a city matures. Investments in smart grid technology generate annual per capita savings of $229.86. In addition, our energy team is currently involved in multiple waste-to-energy projects, distributed generation projects and energy savings initiatives. Learn how we bring smart solutions to our clients and keep an eye out for our Winter 2019 Perspective, focused solely on how our smart projects have changed the communities we serve and how this data will help further our smart solutions initiatives.